Trung Nguyen coffee is among leading beverage brands in my country. As I know, the company was established in 1996, amusingly by a group of medical students. Just after a few years, they had a franchise network of more than 10,000 coffee shops in the country, and were also establishing several café outlets overseas. Now, Trung Nguyen is a major coffee maker in Vietnam. I like their business philosophy to invest in farmers as well as in brand development. Trung Nguyen coffee has been among my favorite since last 10 years. And I’ll tell you why right now. 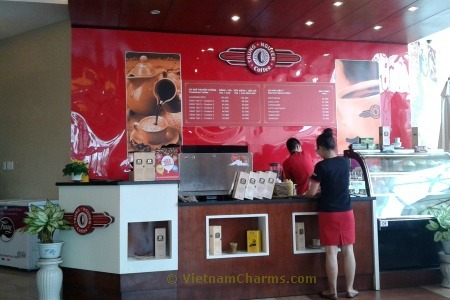 First of all, Trung Nguyen was the first national coffee name with professional and nice shops that had a persistent style: peaceful and professional. Secondly, their coffee tastes so good. At that time, they offered coffees with 8 degrees, which mean different degree of caffeine and quality. I preferred the middle range: number 4. Thirdly, I was impressed by Trung Nguyen’s founder: Mr. Dang Le Nguyen Vu, who quit studying as medical student and pursuit his dream to become a great business man in the land of coffee: Buon Me Thuot. He made it, and gave a great impression on me and other young Vietnamese. A few years ago, however, many coffee shops with similar or better styles appeared. Trung Nguyen at the time, in my opinion, did not maintain high quality and attractive style at their shops. There’s not much difference between Trung Nguyen and other vendors. So gradually I went there less and less. So did many of my friends. When Trung Nguyen coffee appeared as a phenomenon in Vietnam economy, the company founder Chairman Đặng Lê Nguyên Vũ is really a part of the success. Having left university at the third year of studies, Mr. Vu became a well-known entrepreneur and typical mirror for Vietnamese youth, especially who wish to start their own business. I’m impressed by his unique style: bald man in casual costumes with cigar on hand, and crowned in a Panama hat. Forbes magazine honored him the Vietnam Coffee’s King. Besides Mr. Vu, only a few Vietnamese successful entrepreneurs have such honor: Ms. Mai Kieu Lien (Vinamilk), Mr. Ly Qui Trung (Pho 24). Recently, Starbucks had their first coffee shops in Ho Chi Minh City, which threaten the domestic coffeehouse chains, and Trung Nguyen is not an exception. I drank Starbuck coffee several times abroads. It tastes quite different with coffee roasted, ground, and brewed by Trung Nguyen and other Vietnamese makers. Starbuck has their power in global system and experience. Yet, I believe Trung Nguyen have their advantages in local market. Mr. Vu said his company has strength in developing from the beginning (growing) to the end (selling product) of the value chain. And reasonable price is also on Vietnamese companies. Chaiman Vu of Trung Nguyen argued in an article on reuters.com: “They [Starbucks] are not selling coffee; they are selling coffee-flavored water with sugar in it.” People may criticize this is a kind of marketing or PR, but I love the bold idea of the man. At least, he dared to say straightforwardly to a giant rival. I myself like both coffees: instant Starbuck, and Vietnamese coffee that Trung Nguyen is typical and brightest representative. So I vote one for Trung Nguyen coffee, really hope they can compete well on our home market. Have you tasted Trung Nguyen coffee before? How do you think? Please share some of your comments here. Also, if you find useful information here, could you click Like button to encourage me? I love your thumb up.